This year Electronic Music Alliance’s board of directors decided to create a call to action for the community (and the industry behind it) to demonstrate how we can solve world problems with the love and creativity that is signature to our scene. 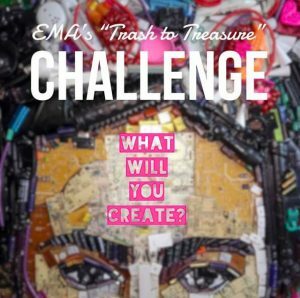 So what is the Trash2Treasure Challenge? It is the creative usage of what might be waste materials, or trash turned into inspiring and impactful art, shows, music, performance, photography, events, activations, community service, or campaigns… the biggest limitation will be your own imagination. On this Earth Day 2018, the submission period has officially opened. By entering you will be recognized! We are giving weekly shoutouts to all those who accept the challenge. You will have the chance to be highlighted for your work, and of course there will be those who will win the top achievement awards (custom pieces from Techwears) and also various prizes tba. Shana Nys Dambrot is an art critic, curator, and author based in Downtown LA. She is the Arts Editor for the LA Weekly, and a contributor to Whitehot Magazine, KCET’s Artbound, Flaunt, Fabrik, Art and Cake, Artillery, and Palm Springs Life. She studied Art History at Vassar College, writes essays for books and exhibition catalogs, curates and juries a few exhibitions each year. Lanni Lantto is a Fashion Redesigner creating clothing entirely out of pre-existing materials meant to be both glamorous and educational. 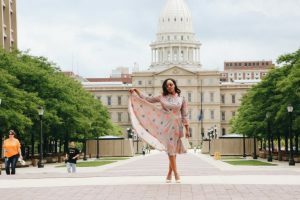 She has shown in numerous eco-fashion shows in the US and internationally, is Co-Creator of Michigan’s largest upcycled (RE)design Fashion Show, and her work has been featured in Sustainable Style Night at NY Fashion Week, Etsy’s ReArt Australia, Global Green’s Pre-Oscar Gala, Altered Couture Magazine, & Coco Eco Magazine. Lanni is dedicated to bringing the concept of creative reuse into the media spotlight in order to use fashion as a catalyst for real change. Phu Styles For the past decade has been known as an international award winning celebrity fashion stylist, influencer, and serial entrepreneur. As a veteran in the fashion and entertainment industry, she has worked with countless high profile names such as actor Ryan Gosling, billionaire entrepreneur John Paul Dejorio, Grammy Nominated dance music DJ/Producers The Crystal Method, and super model Tyra Banks. She has been featured on the BBC, NBC, Fox News, Elle Magazine, and America’s Next Top Model, as well as starring in award nominated shows in Asia. Phu is known for her eco-styling work, having put many celebrities in clothing made from recycled materials and advocating for fair trade and sustainability in the fashion garment industry. Currently, Phu is the CEO and head of investor and influencer relations for Blockchain PR, and an advisor for several companies such as Vetz and the nonprofit, Green Wave. She sits on the board of directors for Electronic Music Alliance. Phu recently founded the Women in Blockchain Foundation. She still manages to mentor for Makeovers that Matter, and Dress for Success and on occasion she is seen organizing a sound bath or as a DJ under the name of Madame Crypto. Taryn Hipwell – Author of How to Shop for Shi(f)t…why because we give a “f”, Founder of Beyond the Label, thought leader and consumer engagement specialist in the realm of sustainable fashion. Beyond the Label (BtL) started as a partnership with TEDxLA to educate Angelenos about the true health, social and environmental cost of their fashion purchases. She teaches “Sustainability and the Fashion Industry” at FIDM, she is on the Advisory Board for the Fashion Department at Santa Monica College, and she moderates panels for TEDxLA, PETA, Fashion Revolution Day and Beyond the Label. She was a keynote speaker in New York at NYU, FIT, LIM and the Berkley School, and she headlines EcoFashion workshops all around the world including “The Green School” in Bali, South Africa and Zambia in Africa. She is a Los Angeles Business Journal – Women Making a Difference nominee and was awarded the Fashion Against Bullying Award and Green Hero Award by eduPOWERED Media Group and Champions Against Bullying. Taryn was the Arts Chair and is currently the Fashion Chair for UN WOMEN-USNC LA (United Nations). Taryn created, produced and hosted EcoDivas TV and has interviewed celebrities including James Cameron, Jessica Alba and Olivia Wilde. Michael Kaliski – Confirmed! – information coming soon about this eco warrior! EMA’s executive Director, Janine Jordan will not be judging. Instead she is ready to shake things up by inspiring individuals and organizations to join the Trash2Treasure Challenge. Janine loves all things eco. In 2006, she experienced what she calls an “eco-awakening” while on a trip in Costa Rica. Since her return 12 years ago, she has been a dedicated Earth (rainbow) Warrior. She loves Trashion, ecobricking, making trash art, and picking up MOOP from the environment. She organized multi-city “massive action” community service events (clean-ups, tree plantings, community gardens, and electronics waste recycling drives) on behalf of EMA for several years with the help of local EMA ambassadors. As a passionate inspiratrix she warns you to “watch out!”- as she may have an idea for you…. Lanni and Dustin Katona will be speaking about Living Laudatio Si and how practicing a sustainable lifestyle IS a part of our faith life. Incorporating the language of Pope Francis’ encyclical “Laudato Si”, explore the depths of living according to our faith through sustainable practices, caring for the poor, and responding to the current dilemma of climate change. The Priory Retreat House is hosting the event in the beautiful Adirondack Mountains. By donation- to register contact the Priory. TV personality, Mariah Harrison twirls around Michigan’s capitol in one FashionREdesign’s vintage dresses (purchased from St. Vinnies in Republic, MI) and shows us how she styles vintage dresses for the wedding season! To see tips and read blog click HERE. An opportunity to collaborate with other creatives and unique indiviuals is a hard one to pass up! 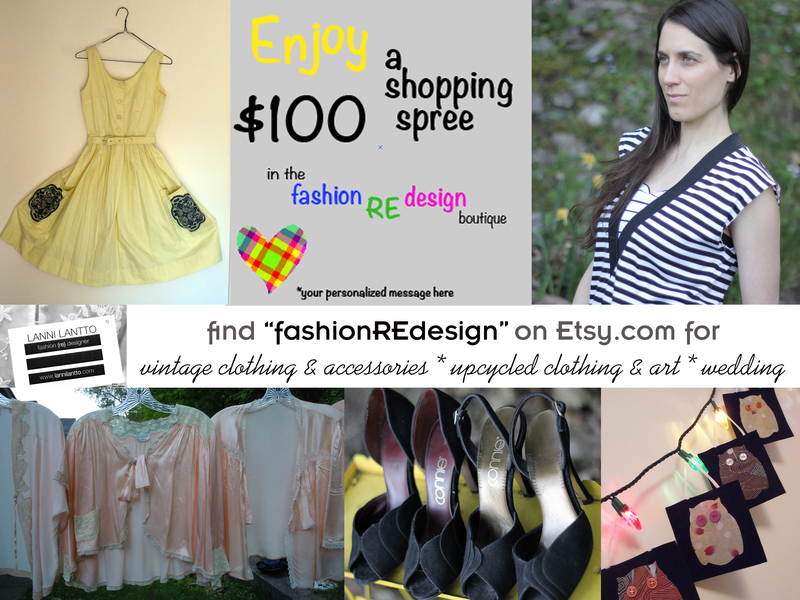 I am collaborating on a giveaway with Lanni Lantto of ( re ), a brand she’s created that focuses on upcycling beautiful clothing! And what better way to learn about her business and the creative process than to ask Lanni herself, so that’s what I did, enjoy the little Q&A below to help you learn more about the amazing work she’s been doing. Don’t forget to enter the giveaway at the bottom of this blog post, Lanni is giving away one of her killer upcylced items! Read the full interview and enter the give-away HERE. April 21, 2016 6:30pm St. Clare Religious Education Center, Green Bay WI: Along with a panel in honor of Earth Day 2016, will be speaking on how the priorities of Pope’s Francis’ Encyclical Laudato Si (On Care for Our Common Home) can be played out in one’s daily lived experience. Will address how my faith directed an ethical career path and how this can be the future for many other Gen X & millennials who find fault in society’s excessive consumerism & throwaway culture. March 12, 2016, 7th (re)Design Fashion + Art Show. 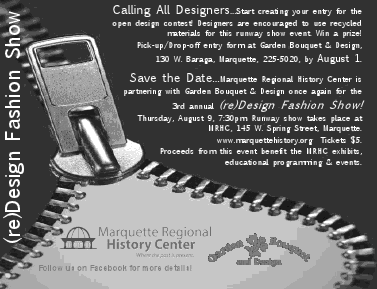 In partnership with the Garden Bouquet and Design, ( re ) by lanni lantto, & the Marquette Regional History Center presents the 7th annual (re)Design Fashion Show. This event is the largest gathering of up-cycling artists in the Upper Peninsula. 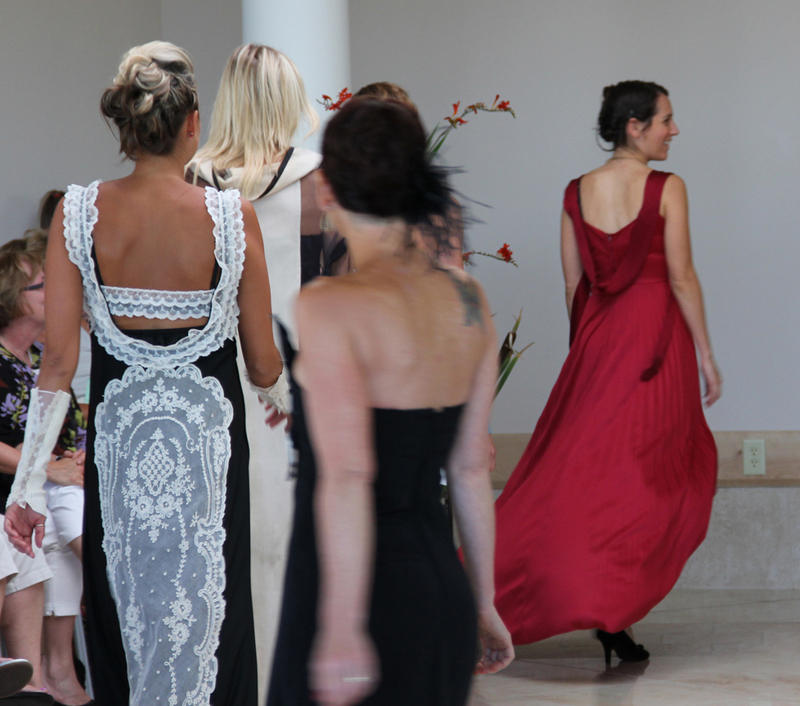 The event showcases local designers who use recycled materials & fabrics to create runway worthy pieces of clothing. 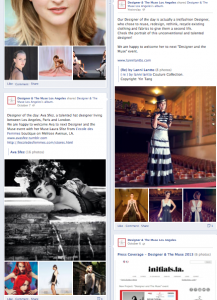 Featured designers have been: Lanni Lantto, Taylor Ehle-2014 designer of the year, Ann Rutkoske -2013 designer of the year, JoAnn Shelby, Angie Kemp, Denise Zdroik-2015 designer of the year, Paulette Carr, and Alexandra Kralova-Zender. The show is for all ages. Local upcycling art vendors will also be at the event. There are over 400 items including upcycled clothing, vintage dresses/blouses/sweaters/aprons/nightgowns/specialty lingerie/shoes/antique jewelery/scarves/pins/hats and MORE! April 11, 2015, Ultimate Ladies Night in Historic Downtown Neenah, WI. Women participate in this special day including a champagne breakfast and fashion show plus pampering, demonstrations and shopping throughout historic Downtown Neenah. Lanni Lantto of (re) will be giving a demonstration on “How to DE-clutter your closet & RE-invent your wardrobe” including step-by-step instructions on how to organize your closet and keep it that way, along with showing how to redesign clothes you already own instead of buying new. Stop by the corner of Church/Wisconsin (look for the clothing racks) any time between 11-4pm. All (re)designed clothing will be $10-20 ONLY for this event! Have (re) do a workshop in your school/town, let (re) give your closet or your business a green make-over, learn more about eco-design 101. Send us a message via our contact page- dates available! 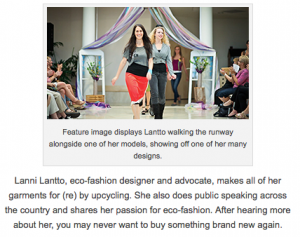 12/6/2014: (re)’s Lanni Lantto speaking at Mount Mary University Milwaukee on Sustainable Design within a Fashion Design Curriculum. Thanks to our intern, Krista who is in the fashion design program, RE will be presenting at Mount Mary University in Milwaukee. We will be introducing students majoring in merchandise management and apparel product development to sustainable fashion design! Many colleges have minimal or no courses in sustainable design so this is an introduction for many of the students. 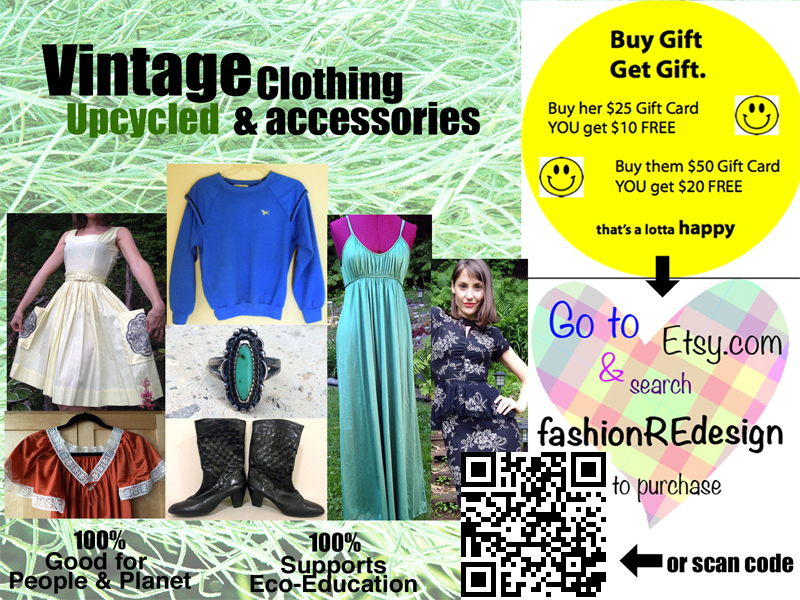 This presentation will be on What is Eco-Design & Upcycling 101 within the Fashion Industry. If you are interested in helping fund future voluntary programs please send to a message to Lanni via the contact page. Mount Mary’s Magazine, Arches wrote a nice article on the presentation HERE. 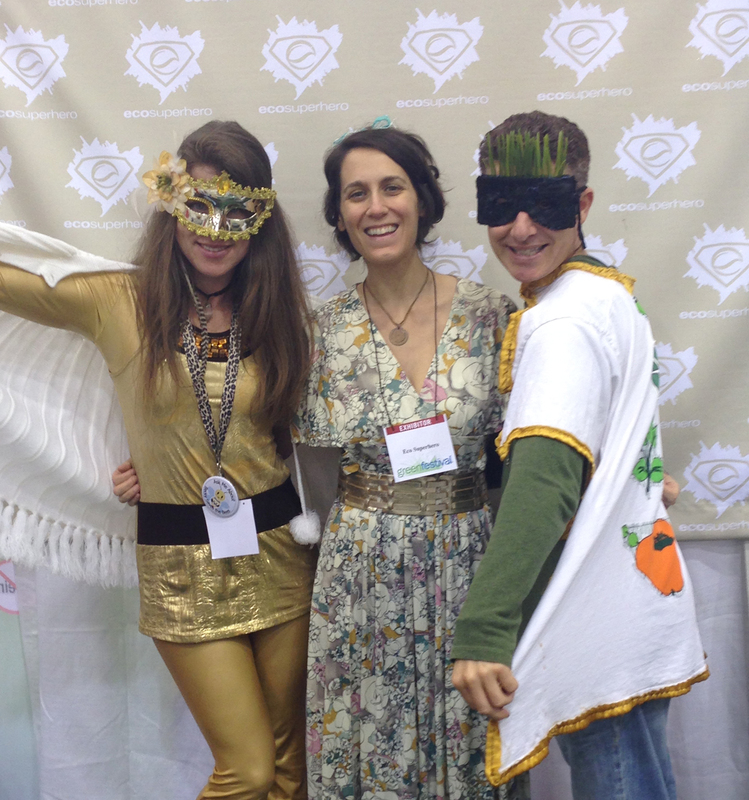 10/24-26 2014 (RE) will be at Green Festival Chicago 2014: (RE) is teaming up with the EcoSuperheros at the 2014 Green Festival Chicago October 24-26! (RE) will have hand selected bespoke specialty Upcycled Fashions available along with 2 Red Carpet pieces on display. 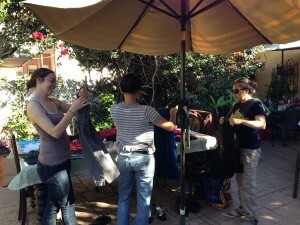 If you are a part of the Saver’s Eco-Fashion Show make sure I interview for an upcoming article for Eco Fashion World. 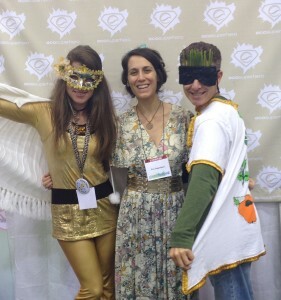 Come by the EcoSuperHero booth and say hi to the team! 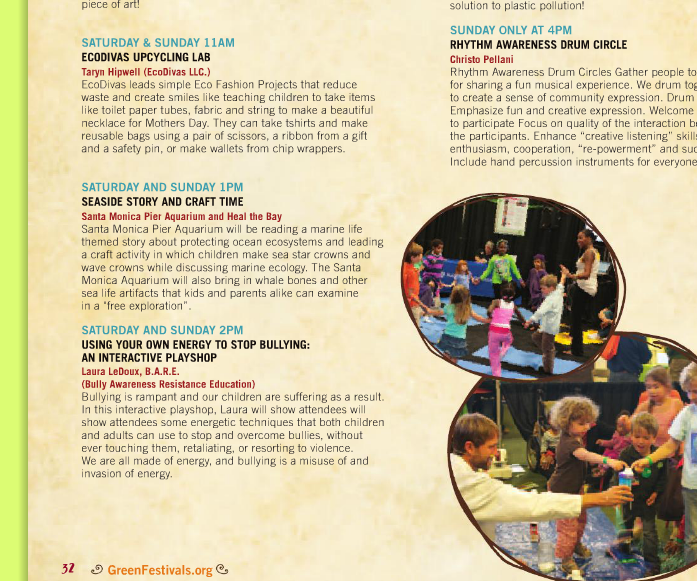 Green Festival always has an impressive line up – check out the schedule here. 5/18/2014 Upcycling Hollywood – (RE) at WorldFest LA : Lanni will be doing a presentation at WorldFest LA about her experience of the ups and downs of bringing upcycled fashion mainstream. From beginning 7 years ago when nobody had even heard the term ‘upcycle’ to moving to Los Angeles in the pursuit of getting creative reuse on the Red Carpet. She will show examples of pieces that have been created using no new waste including photos from Red Carpet events. Her presentation will begin at 11:30 in the EcoTent and details can be found here. //The WorldFest 2014 Earth Day Festival will be held on Sunday, May 18th, 2014, from 10:30am to 7:00pm, at the beautiful outdoor setting of Woodley Park in Lake Balboa, CA. We will welcome our attendees to a magnificent day filled with entertainment, education and enlightenment. The combination of great music, empowering speakers, environmental, humanitarian and animal welfare non-profits, kid’s activities and a delicious food court make for an earth-friendly experience that is sure to be inspiring and enjoyable for all! Lanni Lantto will be teaching the upcycling workshop, Fancy Fabric Flowers at Cheryl Fudge Fashion Camp in Santa Monica. There will be two opportunities to take the class: dates TBA. Please register by calling the store at 310-393-3333, located at 1010 Montana Ave. Class is for all ages, there is a fee. Lanni will teach us how to make beautiful fabric flowers out of 2nd hand clothing. Flowers can be added on to headbands, bags, necklaces, made into pins or used as gift wrapping accessories. A skill you only need to learn once! (RE) Clothing Swap – 12/14/2013: (RE) by Lanni Lantto & actress Angela Sauer are hosting a HUGE clothing swap, not to miss! You know how there are things in your wardrobe that you don’t totally love and never wear, but for some reason are still taking up valuable closet space? It’s time to take those pieces out, find them a better home, and get yourself some shiny new duds in the process! Go through your stuff and find things that you don’t wear/want anymore. Pack them up, and bring them to the swap. Once at the swap, we will do our best to sort things into categories (tops over here, bottoms over there… etc.). Then everyone can go crazy and try things on, hoarding away whatever they like. Near the end of the swap, everyone will gather together to show off what things they’re taking home (it’s always fun to see who’s getting your stuff). Are two people (or three or four) all swooning over the same purse? Any fights over items will be settled by drawing cards. High card wins! Anything that is left at the end of the swap will be upcycled or donated. Message for details, private venue. 12/7/2013 Swap Boutique Fashion Upcycling Event: Santa Monica’s Give + Take Swap Boutique will be hosting me from (RE) for an afternoon of fun! Give + Take is a place where you can swap items in your closet with other items from other people’s closet in an organized membership-only fashion. Pretty amazing. 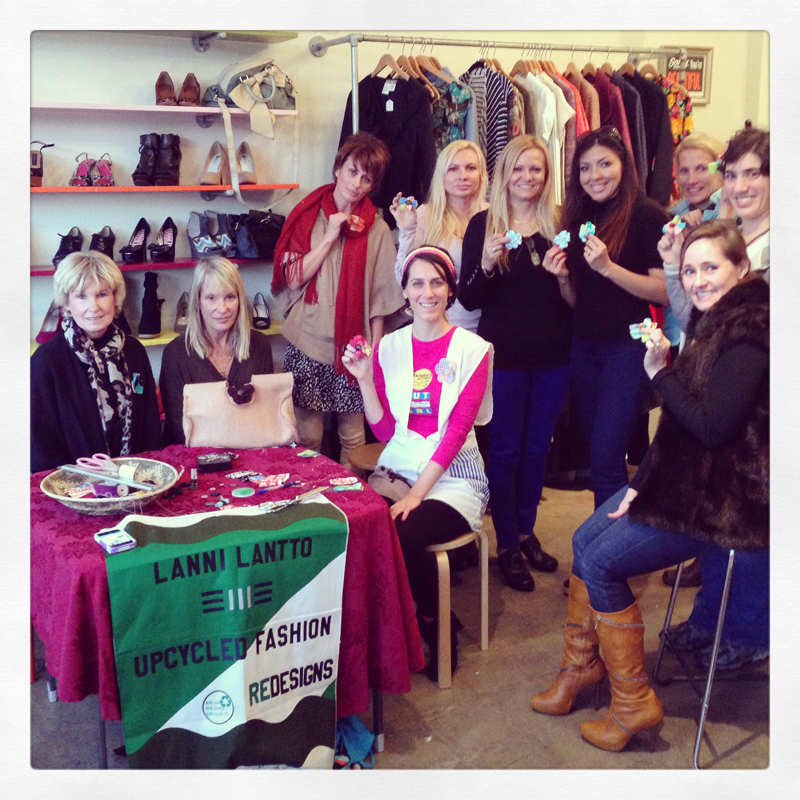 Lanni Lantto, fashion re-designer and upcycler will be demonstrating how to rethink the materials in your closets to create fun new clothing and accessories. She will be making flowers out of t-shirts, clothing & fabric. These flowers can be made into pins, hairbands, rings, decorations, and gift wrapping accessories for the Holidays! Please bring your favorite buttons, small or vintage pins to add on for the center of the flower. (needles and thread will be provided) Make for yourself or use to decorate your packages for the holidays. Fair trade coffee/tea/wine and appetizers will be served on eco-friendly plates/cups! 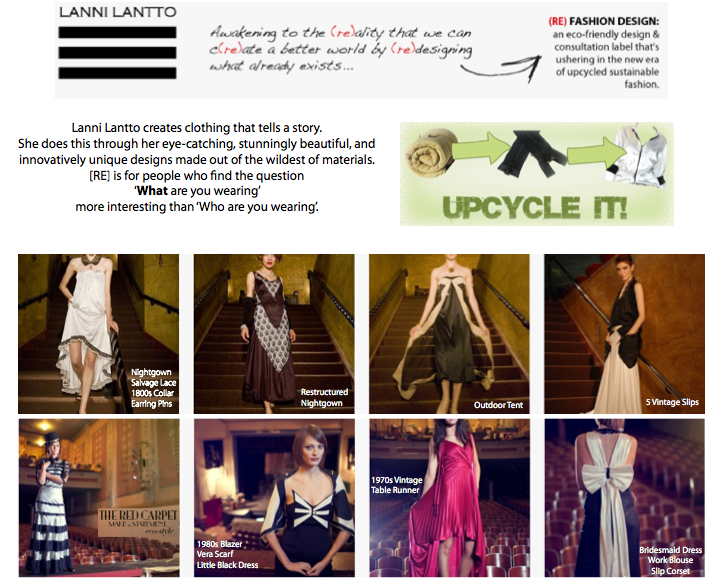 October 23, 2013: Designer & The Muse: Lanni Lantto is a fashion designer unlike any other. In fact, she is a fashion (re) designer. As her label name states, “(re)” stands for reuse, reduce, redesign, rethink, reinvent, recycle. Being creative and unconventional every step of the way, Lanni thrifts for her materials instead of buying new fabric yardage and marries wedding dresses with table runners and garters with suit coats. Having received a plethora of media attention to date, Lanni is participating in Meet The Designer & The Muse, where she will be able to create an amazing design for an inspiring muse of her choice. FGI LA’s signature yearly event, will be held at the Mr. C Hotel, Beverly Hills on October 23. This glittering night showcases L.A.’s hottest designers and celebrates the L.A. fashion community at its finest. Last year’s event brought out everyone from Kevan Hall and Vanessa Williams to Sue Wong, Cameron Silver from Decades and many others. Famous designers in the past, and even well known designers today, have drawn to their muses for great inspirations. For example, Audrey Hepburn to Huberty de Givenchy, LouLou de la Falaise to Yves St. Laurent, and Naomi Campbell to Azzedine Alaia. This FGILA event highlights that very special relationship between designer and muse. LA’s most respected fashion designers and their celebrity muses, will be greeted by media and press—then led to a VIP reception area to meet, mingle, and network with other fellow designers & guests. Hosted by Kathy Hilton. A fun event that mixes Fashion Designer + Fashion’s Muses. FGILA is the Los Angeles regional branch of Fashion Group International—a premiere fashion and business networking organization with a mission “to inform, educate and most importantly connect professionals in the industry with one another”. With its prime headquarter in New York, the organization has over 7,000 members worldwide, in more than 35 regions around the world. This year, the FGILA celebrates its’ 75th anniversary. FGILA is also an organization that gives back. All proceeds from this night’s event will directly go towards the FGILA Foundation which provides merit scholarship grants to local fashion schools. Oct. 19, 2013: Upcycling Workshop @ Green Festival LA: Lanni will be teaching an Upcycling Workshop as a part of Taryn Hipwell’s EcoDiva Upcycling Lab at Green Festival LA, October 19th 11:00am. Come say hello and learn the basics of Upcycling! EcoDivas leads simple Eco Fashion Projects that reduce waste and create smiles like teaching children to take items like toilet paper tubes, fabric and string to make a beautiful necklace for Mothers Day. They can take tshirts and make reusable bags using a pair of scissors, a ribbon from a gift and a safety pin, or make wallets from chip wrappers. Join us at the nation’s premier sustainability event, where you will see the best in green. 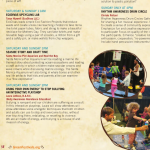 Enjoy more than 125 renowned authors, leaders and educators; great how-to workshops; cutting-edge films; fun activities for kids; organic beer and wine; delicious vegetarian cuisine and diverse live music. Shop in our unique marketplace of more than 300 eco-friendly businesses-everything from all-natural body care products and organic cotton clothing to Fair Trade gifts and beautiful kitchen tiles made from renewable resources. Recharge your batteries with all the hope, inspiration and practical ideas you’ll find at the one and only Green Festival. 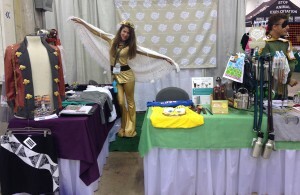 For more information about the two nonprofit organizations producing Green Festival™, visit www.globalexchange.org and www.greenamerica.org. Sept. 9, 2013: [RE] @ Sustainable Style Night, NY Fashion Week: [RE] will be creating 3 pieces made entirely of upcycled materials to be either modeled or on display. They will represent the automobile industrial boom of the 1920s and the push towards a more sustainable future. 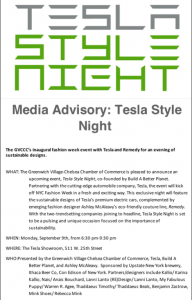 WHAT: The Greenwich Village-Chelsea Chamber of Commerce is pleased to announce an upcoming event, Tesla Style Night, co-founded by Build A Better Planet. Partnering with the cutting-edge automobile company, Tesla, the event will kick at NYC Fashion Week in a fresh and exciting way. 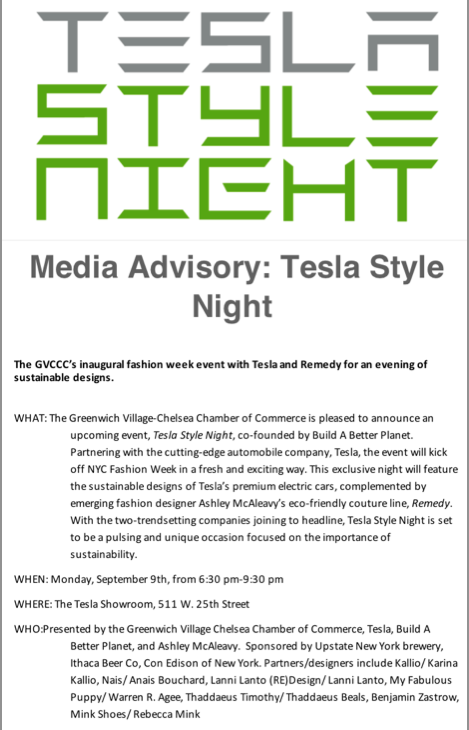 This exclusive night will feature the sustainable designs of Tesla’s premium electric cars, complemented by emerging fashion designer Ashley McAleavy’s eco-friendly couture line, Remedy Designs. With the two-trendsetting companies joining to headline, Tesla Style Night is set to be a pulsing and unique occasion focused on the importance of sustainability. WHO: Presented by the Greenwich Village Chelsea Chamber of Commerce, Tesla, Build A Better Planet, and Ashley McAleavy. Timothy/ Thaddaeus Beals, Benjamin Zastrow. August 23, 2013 – A Fashion Upcycling Exhibit: Amidst the gorgeous setting of the Culver City Garden Theater, we will celebrate the freedom of creative expression through art. Redesigner, Lanni will introduce us to her unconventional process of fashion upcycling; taking forgotten materials and transforming them into romantically stunning pieces of clothing. On display will be examples of her work, including 3 pieces that will be showing at Tesla Style Night, a part of New York Fashion Week 2013 (she will be boarding a plane a few days later so it’s a chance for L.A. to see before NY peeps!). These 3 capsule pieces tell the transitioning story of the 1920s industrial era towards a more sustainable future. Yes, making political art through clothing will surprise you! The CC Garden Theater will be hosting the event and on hand with more information about their monthly free play readings. This event will take place in Los Angeles, CA. June 5th, 2013, Vintage + (RE) Pop-Up Show,: Back by popular demand! 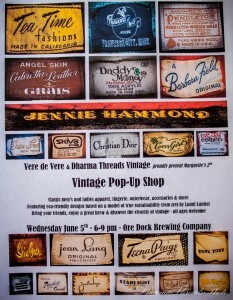 Vere de Vere & Dharma Threads Vintage proudly present Marquette’s 2nd Vintage Pop-Up Shop! 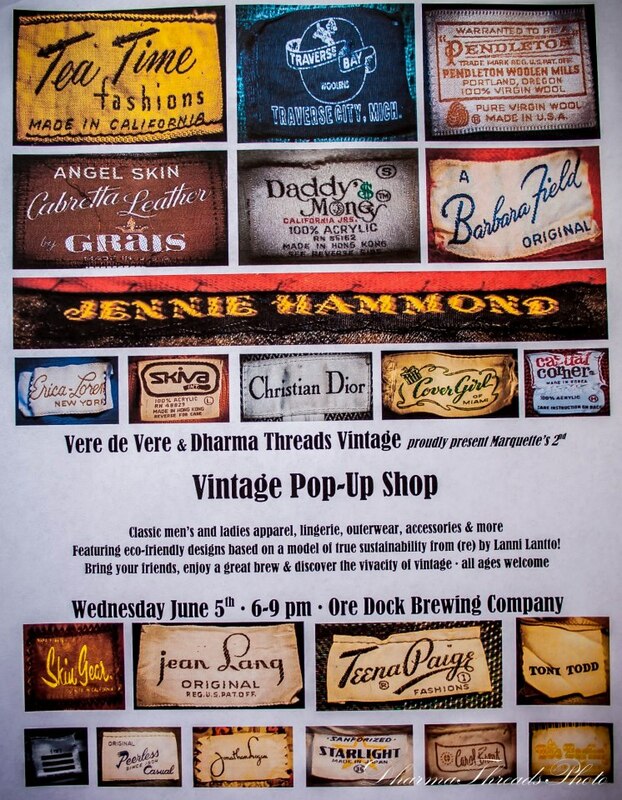 Come to the Ore Dock Brewing Company on the evening of Wednesday June 5th, 6-9pm, for an incredible sale featuring: Classic men’s and ladies apparel, lingerie, outerwear, accessories & more. 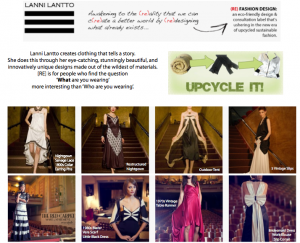 Eco-friendly designs based on a model of true sustainability from (re) by Lanni Lantto! Dressing rooms will be available. Bring your friends, enjoy a great brew & discover the vivacity of vintage. All ages welcome! (RE) is in the process of organizing our 4th (Re)Design Fashion & Art Show, which is being held March 20th @7pm & is a benefit for the MQT Regional History Center. This event is the largest gathering of artists who use mostly or all recycled materials in their designs and has proven, year after year, to grow and expand and bring people in from all across the UP. I aim to gather the most talented designers and have us all under one roof to show & sell our reclaimed treasures to a full house. -) We are looking for artists who use recycled or found objects in their art and would like to have a booth at the event. Your name will be included in the program, table is provided, suggested donation fee is $10 only! Set up is 6:00pm at the Museum. All spots are filled but please contact me to be involved next year! -) We are looking for fiber artists who have a collection of clothing made from recycled materials to be in the fashion show. You will be featured in our press and promotions. -) There is an open call for entries – anyone across the UP can submit a piece of artwork (preferably fiber but not limited too) in the open design contest, must be in attendance and provide model to walk the piece. Juried winner gets a sweet prize! Applications need to be in before the event and can be picked up at Garden Bouquet & Design. -) Come one come all and enjoy an evening of Upcycled Art & Fashion!! 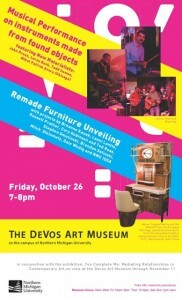 10/26/12, – Devos Art Museum. Musical Performance on instruments made from found objects featuring New Material: John Preus, Leroy Bach, Tadd Cowen, Mikel Patrick Avery (Chicago). Remade Furniture Unveiling with projects by Breanne Kanak, Lanni Lantto and Nicole Corne, Russell Prather, Cory Robinson and Ted Ross, Stephen Smolinski, Brendan Solinski, Mitch Steinmetz, Dale Wedig and NMU IDSA. In conjunction with the exhibition, You Complete Me: Mediating Relationships in Contemporary Art, on view at the DeVos Art Museum through November 11. About the exhibition: Mediate is defined as an intervention to bring about resolution. While we often think about mediation involving a dispute or argument, this exhibition looks at the idea more broadly. The artists and pieces represented intervene by directly and indirectly engaging with other people in the creation of the work. It is only with the involvement of others, either in the making of or the display of the work, that the work can be fully completed. The artists, or the artwork, then become mediators, asking the participant/viewer to negotiate their perspective by becoming part of the work.Featuring work by Jill Frank, InCUBATE, Jason Lazarus, Nikki S. Lee, David Parker, Adrian Piper, John Preus with New Material (Leroy Bach, Tadd Cowen, Mikel Patrick) and Jon Rafman. A full-color fully illustrated catalogue is available with essays by Chicago-based research group InCUBATE and DeVos Art Museum curator Melissa Matuscak. For more information visit: www.nmu.edu/devos. October 1/8/15th 6-8pm “REdesign Your Wardrobe”: Do you have a closet full of old clothes or a trunk full of heirlooms in the attic gathering dust? 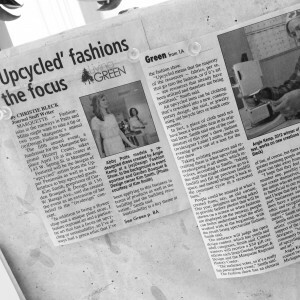 Is living a green lifestyle important to you but you don’t know how that translates to fashion? This workshop will teach you how to rethink and redesign everyday objects into wearable, unique and stylish pieces. By the end of the workshop, you will be able to: be knowledgable about what eco-fashion/upcycling is, rethink how old items in your closet can be made new, actually create a piece of your own to take home! Saturday, November 10th 1-3pm “How to Make a Tshirt Headband” : A class perfect for all ages (8yrs+) this is a class for children and their parents, highschoolers/NMU students who want to show team spirit, men to transform a harley tshirt into a bandana, or anyone who has old tshirts lying around! I will teach you step-by-step how to upcycle your old tshirt into a new headband. Have a favorite logo or design on your tshirts that you want to continue to wear or display – love cutting up old things and making them brand new? Then this is the class for you. Bring your own tshirts; scissors, pins, and hand needles and thread are provided. 8/9/12 3rd Annual ReFashion Fashion Show. Downtown Marquette is welcoming the 3rd Annual ReFashion Fashion Show, August 9, 2012 7:30pm at the Marquette Regional History Museum. 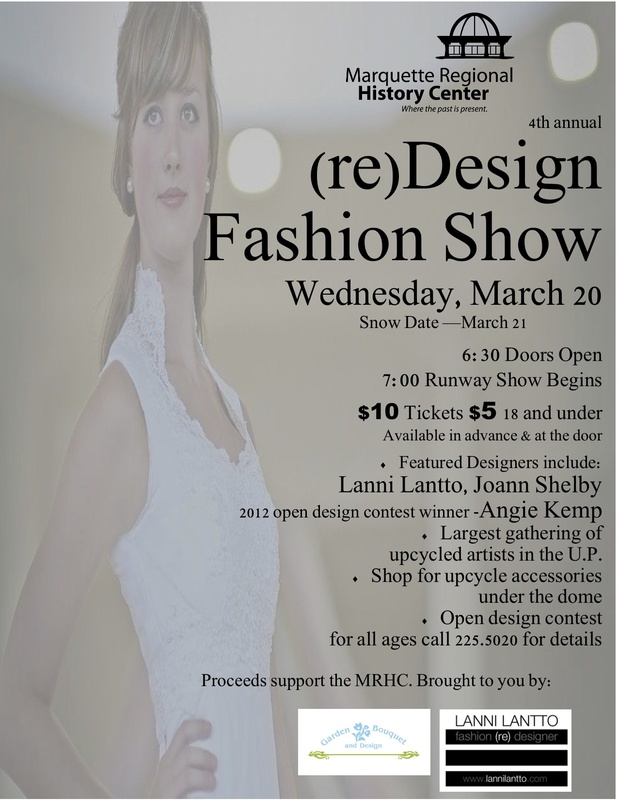 Put on by Garden Boutique and Design & (re) Lanni Lantto, the show is a fundraiser for the Marquette Regional History Museum. Re-Fashion is a term for designing in an eco-friendly way by reusing creative pre-existing materials and, therefore, reducing textile waste. 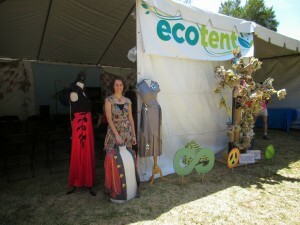 CALL FOR ENTRIES: Create a piece of out recycled materials and YOU can be a part of the show! 5/11/12 Pathways to Your Future Career Day. Lake Superior Partners in Education Committee works to identify and address workforce-related issues across Marquette County. Currently, LSPE is organizing the annual Pathways to Your Future Career Day which will be held on Friday, May 11, 2012. 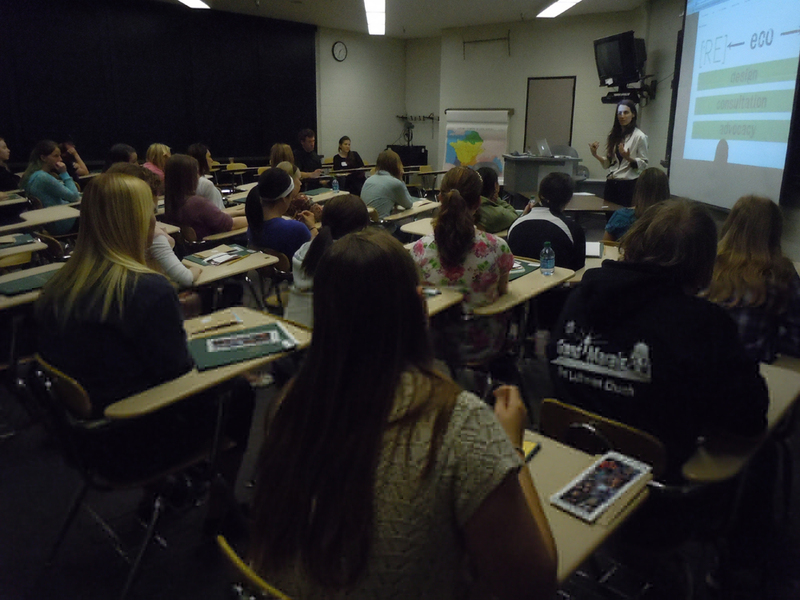 It takes place on the Northern Michigan University campus and over 500 high school students across the U.P. are registered to attend. (RE) by Lanni Lantto will be at the event speaking to the high school students about her career as the owner of an eco-fashion label. A selection of professionals in diverse industries will be talking about their experiences which will be a motivating, educational experience for students choosing a career path. 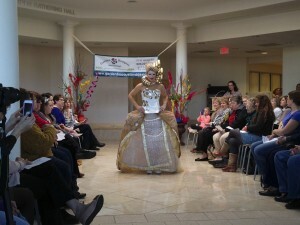 4/21/12 Earth Day Fashion Show. 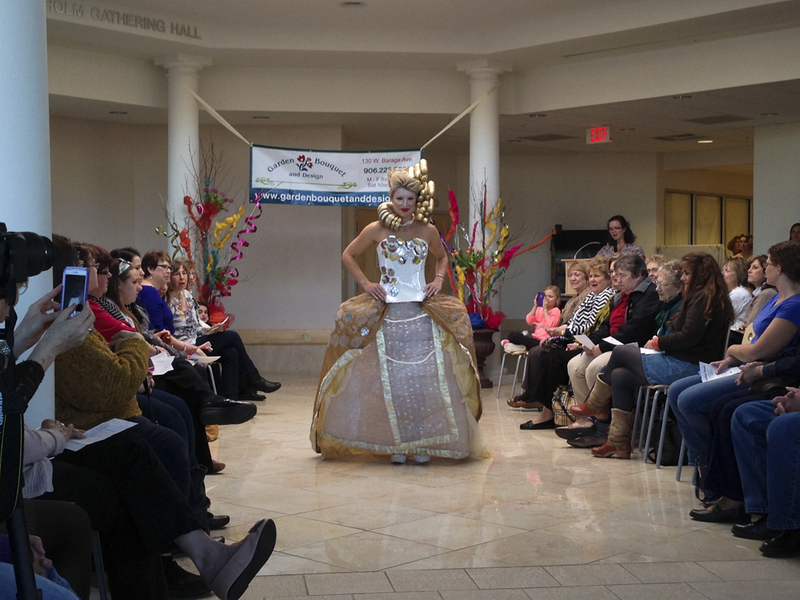 What better way to celebrate Earth Day than with a fashion show put on by St. Vincent de Paul?! The event will run from 11-3pm with various eco-friendly vendors, educators, and a luncheon will be served at Republic Michigamme School. The fashion show will start at 2pm. The first part will feature various wares straight from the St. Vinnie’s in Republic while the second part will feature Lanni Lantto’s REDESIGNED clothing from various St. Vinnie’s in the UP. This is a benefit show so that St. Vincent’s de Paul can buy a much needed new roof. 3/25/12. Project Compassion Fashion Show. (re) will be showing a line of pieces for Project Compassion, a benefit fashion show to raise funds for Camp Star. Get a sneak peek of this year’s clothing lines from various retailers in the Marquette area and beyond. Prizes will be raffled throughout the event. Admission is $5 for the general public and free to NMU students with ID. Doors open at 6:15pm and the runway lights up at 7pm. Northern Michigan University. 12/10/11. The Marquette Sister City program has chosen Lanni Lantto as their Artist Delegate for 2011. While in Higashiomi Japan, Lantto had a chance to showcase her art along with giving a fashion show and educational upcycling demonstrations. On December 10th from 1-3pm at the Joy Center in Ishpeming, Lanni will present “An Afternoon in Japan”- open to the public! The presentation will be a mix of stories, photos and videos, and sampling of Japanese fabrics- come ready to be entertained! Topics to be shared include; What do the Japanese people do with their unwanted clothing- do they throw it away, do they have thrift stores, do they make their own clothing or swap? How did they react when I cut a tshirt with scissors in front of 50 high school students? What creative upcycling project surprised me at my workshop with 15 older Japanese ladies in the mountains of Eigenji? What is every day life like living with a host family for 10 days- what are the similarities, the differences, and how do you get out of eating the octopus? Join in the cultural exchange without having to travel across the International Date Line! See you there! 12/1/11. Celebrity Art Auction. Lanni was nominated as one of this year’s celebrity artists to create an exciting piece to benefit the The Upper Peninsula Children’s Museum. December 1st. 5:30 Viewing, 7:00 Auction. Free Entry. 123 W. Baraga Avenue. 9/23/11. The Zero Degrees Artist Gallery Textile Showcase highlighted all of the talented local artists who work with fabrics among the 50+ artists in the gallery! (re) by lanni lantto has a TON of new pieces. 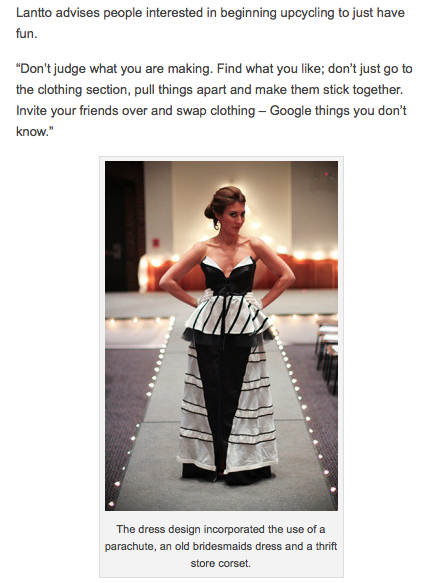 8/4/11 2nd Annual ReFashion Fashion Show. Fashion Show & Design Contest featuring ( re ) by lanni lantto was August 4, 2011 . Garden Boutique and Design fundraiser for the Marquette Regional History Museum. Re-Fashion is a term for designing in an eco-friendly way by reusing creative pre-existing materials and, therefore, reducing textile waste. 4 local designers will presented collections unlike anything you’ve ever seen before. 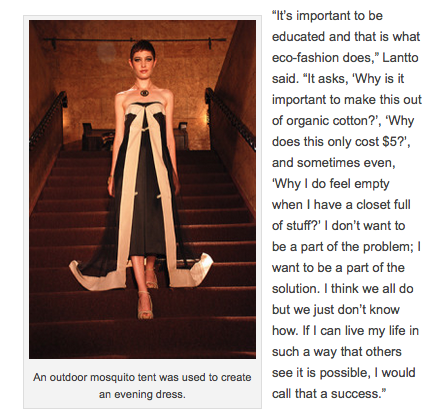 Lantto presented a new line of runway dresses. 6/25/11. 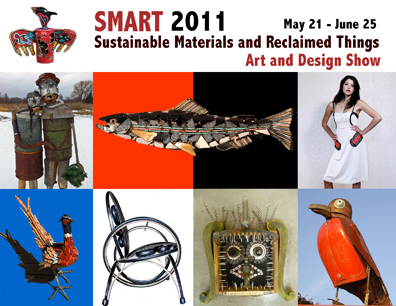 SMART (Sustainable Material and Reclaimed Things) Art and Design Show will feature art, furniture, instruments, portable buildings, craft, & clothing all created out reclaimed materials. This juried and invitational show will feature top recycled artists and designers from Michigan and around the country. Works from the following artists will be includes: Ritch Branstrom, Andy Gregg, Betty Bea Washburn, Robert LaLonde, Tom Kaufmann, Jeff Krino, John Goss, Stella Larkin, Karen Godfrey, John Unger, Doug Delind and Lanni Lantto. (re) will be showing in the closing reception’s Upcycled Fashion Show on Saturday, June 25th. The Cycling Salamander is a fine art gallery outside the city of Charlevoix, Michigan located on gorgeous Lake Michigan. 4/30/11. Upstate NY Upcycled Fashion Show. 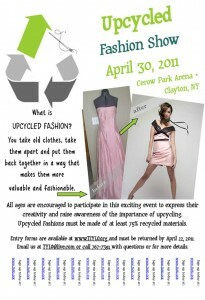 The small town of Clayton, NY will be hosting it’s first ever Upcycled Fashion Show – to raise awareness and inspire all ages in Upstate, NY. Ithaca native, Lanni Lantto, will be sending some pieces for the runway show. April 30th, Cerow Park Arena, Clayton, NY. Click HERE for more details. 4/2/11. 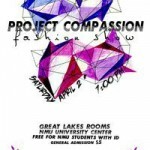 Project Compassion Fashion Show at NMU. 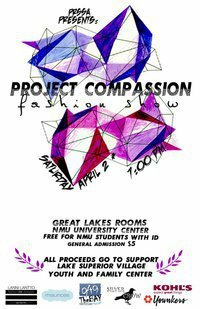 (re) will be showing a line of “ready-to-wear” pieces for Project Compassion, a benefit fashion show to raise funds for the Lake Superior Village Youth and Family Center. All pieces in the show plus more after the show will be for sale. 3/31/11. The Marquette Regional History Center, 145 W. Spring St., Marquette, will host “Bloomers and Corsets: The History of Women’s Restrictive Fashion”, at 7 p.m. Thursday, March 31. Admission is free for center members, $5 for others. Eco-fashion designer Lanni Lantto will present on restrictive fashions throughout history. From steel case bustles and rib altering corsets to forbidden bloomers, Lantto will show fashion’s role in women’s liberation. Lantto has taught Women’s Studies at Ithaca and Wells College and lectured internationally on women’s empowerment and social activism. Also featured will be a slide show and examples from the history center’s permanent collection. 01.04 Join the Fashion (RE)volution!